German soldiers prepare for urban combat during Operation Barbarossa. 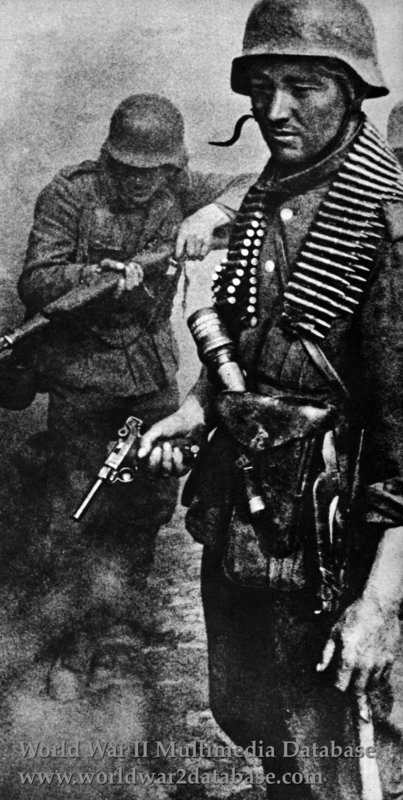 One is carrying a Mauser-manufactured P08 Luger, Stielhandgrate 24, and a belt of 7.92mm (.32 caliber) ammunition for a Maschinengewehr 34 (MG34) machine gun. The other is checking the action on his Mauser Karabiner 98 Kurz. Reichsklanzler (Reichchancellor) Adolf Hitler repeatedly ordered that urban combat be avoided; at Kiev, Leningrad and Moscow, he refused permission to send German forces into cities. Nevertheless, German troops had to clear various villages, towns and cities during Operation Barbarossa. The Germans were fully committed to urban warfare in 1942 during the Battle of Stalingrad.